This week on our national parks journey, we leave the United States mainland and travel down to the Caribbean. 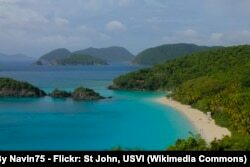 There, you will find three islands that make up the United States Virgin Islands: St. Croix, St. Thomas and St. John. The Virgin Islands National Park is a tropical paradise on the island of St. John. The park covers more than half of the small island. It is surrounded by the Atlantic Ocean to the north and the Caribbean Sea to the south. The climate here is warm all year. Tall green peaks rise from the ocean, which is filled with wildlife. The island’s white sand beaches and clear blue seas are considered to be among the most beautiful in the Caribbean. Evidence of human history on the island dates back thousands of years. Archaeological evidence shows the first people to arrive on the Caribbean islands came in canoes from South America more than 2,750 years ago. The Taino people lived along the shores of St. John island. Over the years, the population of the Taino natives grew. 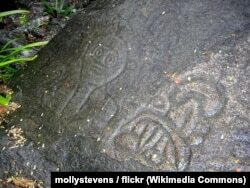 You can see evidence of the Taino culture in the petroglyphs within the Virgin Islands National Park. Christopher Columbus first saw the island in 1493. Later, Spain, Holland, England and Denmark all tried to claim the Virgin Islands as their territory. These nations sought to profit from the production of two main crops: cotton and sugar. The crops were grown on large farms, called plantations, that once covered the island. African slaves and indentured servants were forced to travel on ships in terrible conditions to live and work on the plantations. In 1733, the slaves revolted. During the revolt, almost one quarter of the island’s population was killed. Plantations were destroyed. 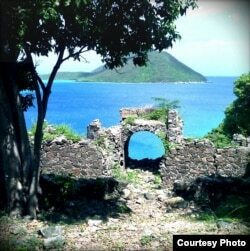 In 1762, after many struggles, Denmark took control of the Virgin Islands. Slavery in the Danish-controlled Caribbean islands ended in 1848. After that, St. John’s crop production and its population greatly declined. In 1917, the United States bought the islands of St. John, St. Croix and St. Thomas from Denmark. By the 1930s, news of these beautiful American islands spread to the mainland United States. It was the beginning of what is now a profitable tourist industry. And in 1956, land on St. John island formed America’s 29th national park. Laurence Rockefeller was an American millionaire, businessman, conservationist and philanthropist. He visited St. John in the 1950s. He quickly fell in love with the island’s clean, pure beauty. He purchased a small resort there, Caneel Bay. He also purchased more than 2,000 hectares of the island and donated it to the government. That donation created the U.S. Virgin Islands National Park. It was officially opened as a national park on December 1, 1956. Along with land, the Virgin Islands National Park today protects almost 3,000 hectares of coral reefs, marine life and shoreland. In 1978, much of the nearby Hassel Island was also donated to the Virgin Islands National Park. The only way to reach the park is by boat. Some people arrive on their own sailboats. Others come in on large cruise ships. Visitors also arrive on water taxis from the island of St. Thomas. St. John offers many kinds of places to stay: very large or very small hotels, villas, or campgrounds with wood framed tents. At Cinnamon Bay, visitors can rent an empty camp space and set up their own tent. It is an affordable and adventurous way to stay in the park. 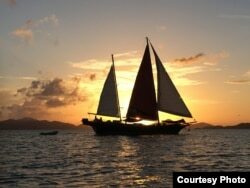 ​From the tropical hills to the blue waters, there are many things to do at the Virgin Islands National Park. Visitors enjoy fishing, camping, sailing, scuba diving, snorkeling, and bird watching. There are many paths to take. Some of the walking paths lead visitors to historical ruins. These ruins help explain the park’s cultural history. The Peace Hill trail, for example, is a short walk up a rocky and sharp hill. It leads to the Peace Hill windmill ruin. People built the windmill centuries ago. The windmills made energy for sugar production. The Cinnamon Bay Trail goes through a forest and leads to the ruins of the Cinnamon Bay Sugar Plantation. Along the way, hikers smell the scents of mango, kapok and apple trees. Some of the oldest and tallest trees in the park are found along the Reef Bay trail. 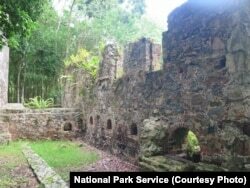 Hikers also pass Danish sugar plantation ruins, stone walls, and ancient rock carvings, or petroglyphs, from the Taino people. Along the way, there is also a huge waterfall, fresh water pools and animals, such as deer, bats and land crabs. Some of the hiking trails end at a beautiful beach where you can swim, snorkel or dive. Of all of the park’s beaches, Trunk Bay Beach is said to be the most striking. Below the clear blue water is a 200-meter snorkeling path. Signs beneath the water describe the turtle, coral and exotic fish species found here. Hawksnest Beach is also a popular place for snorkeling. Near the shore are three small reefs of Elkhorn Coral. The Elkhorn Coral gets its name from its shape. The reef looks similar to the huge horns of an animal called an elk. It is a very rare kind of reef. Scientists say it is in danger of becoming extinct. The Virgin Islands National Park is often called America’s paradise. It protects St. John's pristine nature, and preserves the record of human history in the Caribbean. Dorothy Gundy reported on this story for VOA Learning English. Ashley Thompson was the editor. Have you been to a tropical paradise? Let us know! Write to us in the Comments Section.